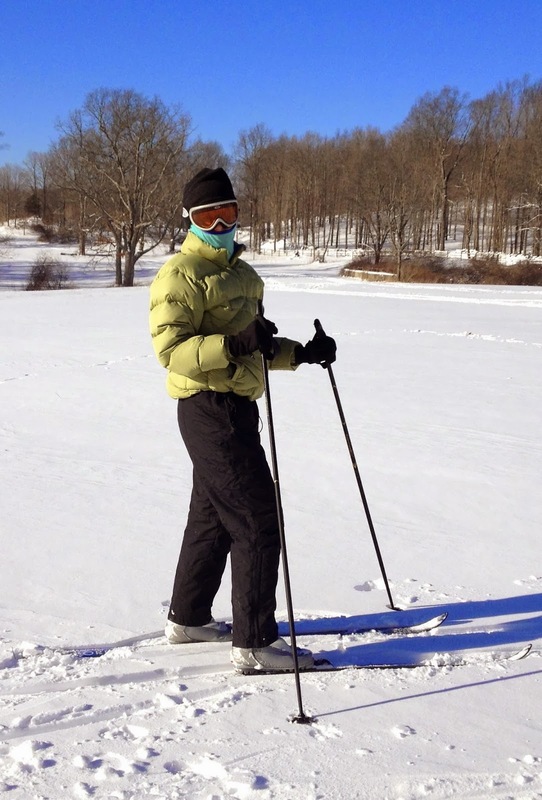 Me cross country skiing. It's12 degrees out, but I got my exercise for the day! It is that time of year to batten down the pantry and get a grip on our weight. I tried to restrain myself over the holidays, but we all do it… we over eat a little because there are so many wonderful seasonal treats that we must taste, unfortunately the older we get, the quicker the weight packs on from just a little over doing it. Here are my strategies for shedding those extra holiday pounds. 1) Clear the house and your work space of high calorie treat. If you have unopened boxes of candy, donate them. I bring things to our local nursing home, elderly folks love getting a little sweet with their meals. A food pantry is a good place to drop unopened treats. Replace them with portioned sized bags of nuts and a big bowl of fruit. 2) Don't eat snacks out of bags. If I have chips or crackers I check the bag for the portion size and I measure it out into a bowl. I don't start eating until I have put the bag away. 3) Eat mindfully. Don't drive thru and eat driving. Sit a table and eat. Stop working for a few minutes and pay attention to your food. You will enjoy it more and eat less because you'll notice when you are satisfied (not full) if you are paying attention to eating. 4) Reduce your intake of fatty high calorie foods. A small pat of butter is a 100 calories, so is the same amount of cheese. Spread your butter lightly on your toast and skip cheese and crackers for a snack. A little cheese with a piece of fruit or fruit with a tablespoon of peanut butter is better. Be careful when you make dinner not to make more than one cheesy meal per week and when you make it, go light on the cheese. Switch to low fat mayonnaise. Mayonnaise is another high fat and calorie ingredient that can add weight. 5) A portion is a deck of card. Remember that when you eat a burger or steak or get a take out sandwich at a deli. You usually are receiving about 2 to 3 portions which is way too much. I cut a deck of cards size piece and pack the rest up for another meal. 6) Don't drink your calories. Study after study shows that your body doesn't register liquid calories. You don't get full from that 600 calorie latte. Drink water with your meals and coffee and plain tea between meals. I like seltzer with a squeeze of lemon when I feel like having a bubbly drink. 7) Eat Breakfast. It will prevent you from having a sugar crash which will make you crave junk food. It also energizes you for the day. 8) Don't eat after dinner. If I start craving food at night I make herbal tea and sweeten it with Stevia. I put it in pretty tea cups making it a treat. I know I can have as much as I like. I keep a big assortment of flavors on hand. Studies have shown that it doesn't matter when you actually eat, but people who eat at night tend to eat more calories. I also find that if I eat after 8pm I am not hungry for breakfast the next morning, which I think starts a bad cycle for the day. 9) Weigh yourself every day at the same time. I weigh myself when I get up in the morning because I know that is the time of day I weigh the least, but I still can catch when I start gaining weight. It really is a good reality check to weigh yourself daily. It is so much easier to loss an extra 5 pounds than an extra 10 pounds…which is about how much you've gained before your clothes get tight. 10) Exercise everyday. Even if it is only a 20 minute walk or a 30 minute exercise video. I have a friend who put a treadmill in front of her TV and watches it as she walks when she gets home from work. Exercise is critical for your health and it is critical to keep weight off and to loss extra pounds… our bodies need to move. You will have more energy and less aches and pains if you exercise. Good luck getting back into those skinny jeans. I know you can muster up the self-displine to do it, because you care about your health. I used to have a shoe bag filled with snacks in the hall for the kids... because my husband would pass them all the time he ended up eating them and gaining weight. We all succumb to temptation; it is so hard with kids not to have some treats around. I try to get them things I don't like, which isn't much. Whatever works for you. The scale keeps me in check. I know if I need to eat less that day if I see the weight has gone up. Yes, when I lift weights I definitely weight more and I take that into account. Thats quite a Freudian slip. Thanks for the bowl correction. Good for you with exercise... it seems that it is OK to have a few extra pounds on you if you exercise regularly.